"It is heartening to know about the initiatives of the Henning Holck-Larsen Foundation in getting Denmark and India closer together thru the "India Today" project so that the people of our countries could come to know about each other's culture, literature and way of living. Educational exchange, the other dimension of the Foundation's efforts, is quite welcome." 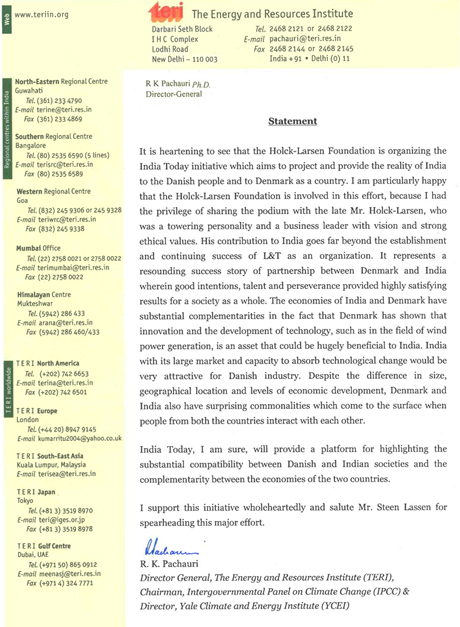 “Considering my close past affiliation with Henning Holck-Larsen and L&T’s long relationship with Denmark, I am willing to accept the position of “Honorary Chairman” for the “India-Today” project. To further support the cause of the project, L&T is happy to contribute USD 500,000 towards making it a spectacular event. "India Today is adding value to the excellent bonds between India and Denmark. With the Joint Commission and with the joint priorities set out in the agreed minutes of December 14th, 2010 that I signed during my first visit to India, our cooperation is taken into the future. From government-to-government, from people-to-people and from business-to-business new ties will be made. 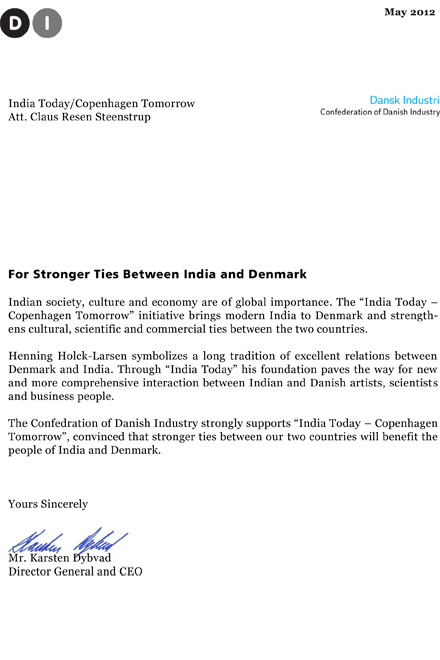 India Today/CopenhagenTomorrow, India and Denmark fostering trade, culture and science – a new beginning!" "The cooperation will now be extended so that in the coming years we will see more Indian culture in Denmark, owing to the privately funded project India Today which has set up a large exhibition of art at Arken near Copenhagen. In addition, funds will be earmarked for interchange between Indian and Danish technical universities. We would like more of this because, as the former development minister Poul Nielson (S) once said, the world outside Denmark is far bigger than the world outside most other countries. He is certainly right about that, not least compared with a huge country as India. Therefore, it is also my clear hope that in the coming years there will be much more India in Denmark and even more Denmark in India." "India Today is a unique tribute to the legacy of Holck-Larsen - one of the founders of Larsen and Toubro. Art, fashion, people and business will forge unprecedented bonds between India and Denmark. India Today - Copenhagen tomorrow will set new benchmarks for the Indo-Danish cooperation - merging the past and the future. As ambassador of Denmark to India I give my strongest support to India Today that jointly will take us into the future." Ashok Kumar Attri, Indian ambassador to Denmark 2010-2013, was involved in the project and actively supporting the initiative, and thereby furthering the bonds between India and Denmark. Professor, Dr. R.K. Pachauri, Director-General of TERI (The Energy and Resources Institute), Chairman of IPCC (Intergovernmental Panel on Climate Change), Member of Committees of the Government of India and Member of the Economic Advisory Council to the Prime Minister of India, was also supporting the project. "Privately it has been of great importance for my family and myself to establish close relations with Henning Holck-Larsen, who came to be one of our closest friends. We, whenever he was in Denmark, met very often and listened to all his ideas about how India could develop and how L&T could contribute. He had great many visions and because of his winning personality and personal network could realise most of these visions. It was important for him to base his work on personal relationship, so he could explain his ideas and listen to comments – listen but not necessarily accepting. He took my wife and me on trips around India, visiting many important Indian establishments. Thus he brought my family – and our company to an understanding of the background for government and not the least the private sector activities. 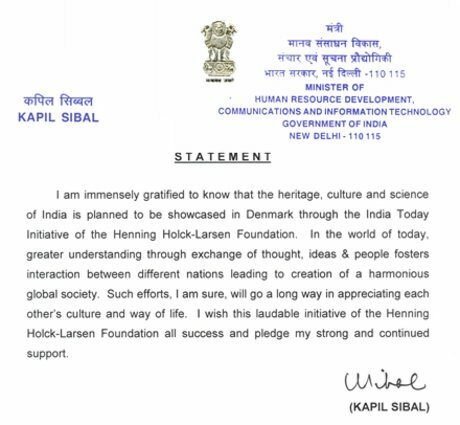 Thanks to Henning Holck-Larsen we got a better understanding of Indian history, culture and Indian contribution to science. Through him we also learned how India could develop after 1947. I was thus grateful that I could show my gratitude and explain also business relations with Henning Holck-Larsen – and L&T- in Nehru’s Palace in Mumbai in 2006. Our corporation has enjoyed close relations with India government and private enterprises involved in development of technology. We are grateful for the many relations we have had with enterprises and personal colleagues and friends all over India, going all the way back to the years before the war. India today is developing very fast, thanks to the interplay between governments, where the activities of Manmohan Singh as a Finance Minister many years ago was an important “point of departure”. We in Denmark would be grateful if we can be part of India Today and India Tomorrow, so important for global matters.